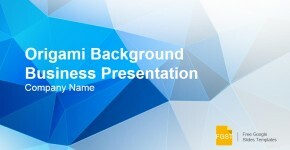 The Origami Background Business Presentation is a formal Google Slides Template designed for corporate environments that require an homogeneous theme look & feel. The theme backgrounds are created with high quality images resembling origami paper designs, in a bright professional blue palette. The charts and diagrams are created using Google Slides shapes, and are 100% editable. The Google Slides Template provides traditional sections as Agenda, Services, Team, Charts, Dashboards, Welcome and Thank you Slide designs. The fonts, photos, images and icons are free to use and distribute. Download the Origami Background Business Presentation to create your next business presentation and impress your boss. Looking forward for further feedback. Great template for school presentations. Thankyou!